Windows Hello for Windows 10 Mobile has been a great feature for a lot of people, making it so logging into your mobile device is as simple as lifting it up to your face. While the technology isn’t perfect, it’s provided tons of convenience for a crowd of consumers who are always looking for the newest in technological advances on their mobile devices. Where Windows Hello’s facial recognition has been nice, however, some may well argue that the fingerprint recognition on many other devices outpaces it. Many times, Windows Hello for mobile requires you to lift your phone up quite awkwardly while the phone logs you in – a problem that fingerprint readers just don’t have. Thankfully, we now have confirmation that a fingerprint reader is coming to Windows Hello this Summer (via MSPU). 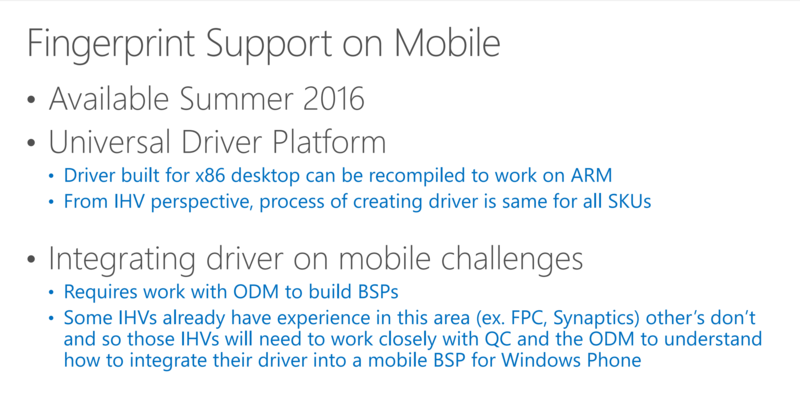 Fingerprint support incoming on Windows 10 Mobile. The news comes from the Winhec conference, and you can check out a slideshow that shows off all of the news that came with it right here. If this is correct and fingerprint reading is on its way to Windows 10 Mobile within the next couple of months, Windows Hello users on mobile ought to be excited. Windows Hello has been one of the nicer features that Windows 10 Mobile users have available, so seeing such a dramatic improvement is going to be good to see. Will you use fingerprint reading when it comes out, or stick with face recognition?